Introducing Waiting For a Girl Like You, brand new contemporary romance by Christa Maurice! Happy release day, Christa! Christa Maurice has been obsessed with rock stars from early childhood when her older brother started randomly quizzing her on rock trivia. How many first graders know who the headliners were on the Black and Blue Tour? Christa did. (Black Sabbath and Blue Oyster Cult.) When not listening to music and/or writing, she enjoys traveling, reading and science fiction. 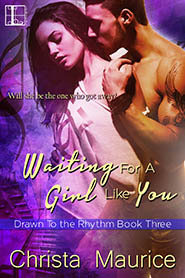 Waiting for a Girl Like You is the third book in her Drawn to the Rhythm Romance series. Readers can find Christa on Facebook, and visit her website at christamaurice.wordpress.com. No worries, thanks for coming! I agree, 'scandal' is a great word. This sounds like a fun series!